Spring is popping up at Cloches and Lavender. The weather still has not gotten the memo, LOL. That is spring in NJ. I decided to add more touches of spring in the kitchen on a table that is near the kitchen table. I used a box I purchased very inexpensively at all places the food market. It was a display piece at Christmas and I loved the color and look of the box so I snapped it up. The color works perfectly for the kitchen and great room. I kept this a bit simple by adding some lace that was my grandmothers. thinking this added a soft touch. I placed a 6″ moss ball and surrounded this with snippets of lavender. Shock, right? I have mentioned that I adore green and lavender together. I used some French pieces I won in a giveaway. They are Christmas ornaments but I chose to cut the twine hangers from them to use in displays. I placed one inside a rustic birds nest purchased from Save on Crafts. 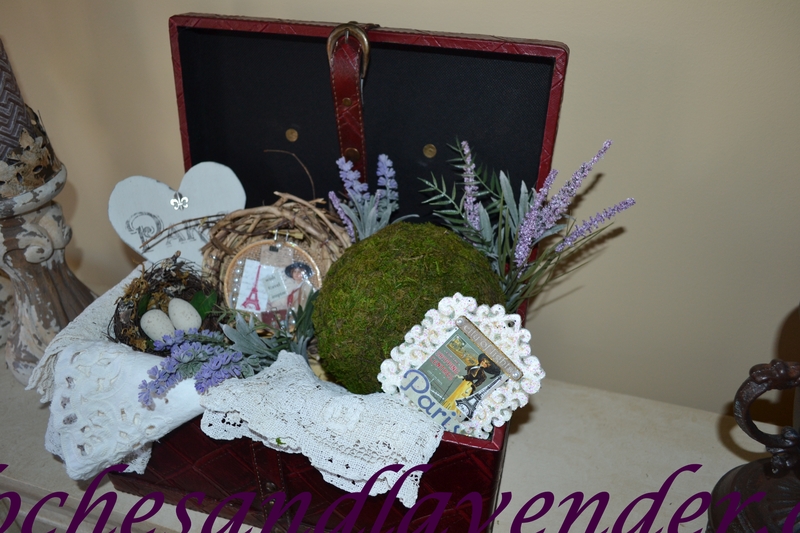 I also added a tin Paris heart that I ordered from Rosemary from Villabarnes. I placed another birds nest with some wood eggs I painted using ASCP. I think this is a simple subtle spring vignette in the kitchen. More spring vignettes coming soon. Thanks for stopping by and hope you are having a great week. 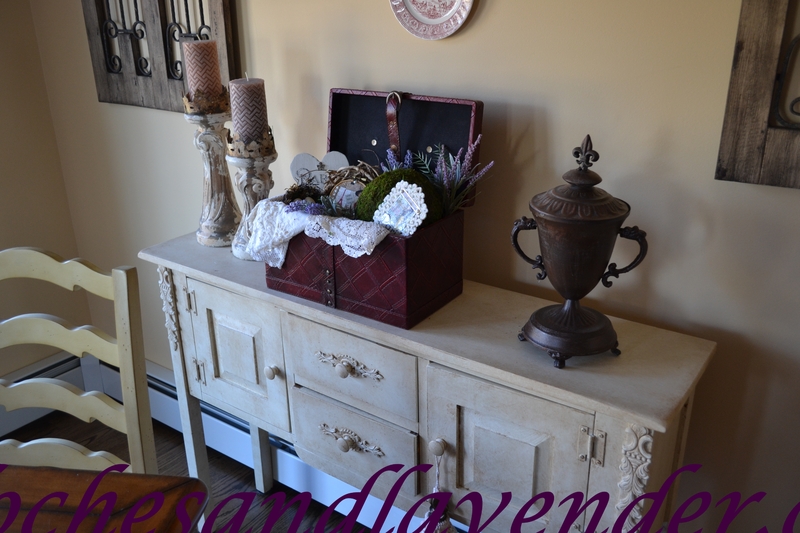 Lovely vignettes with treasures galore. I love how you layered them in the unique box. It’s perfect…You are having way to much fun in your new house lol! 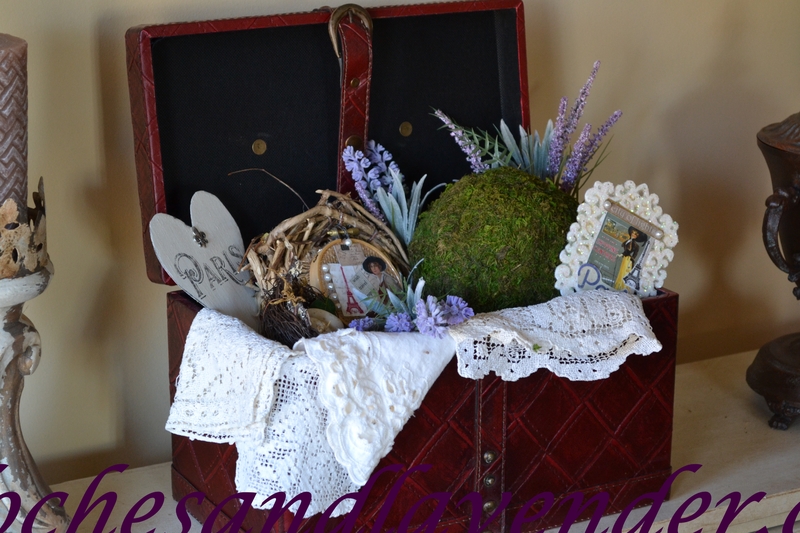 I love the French themed vignette you created in your box! 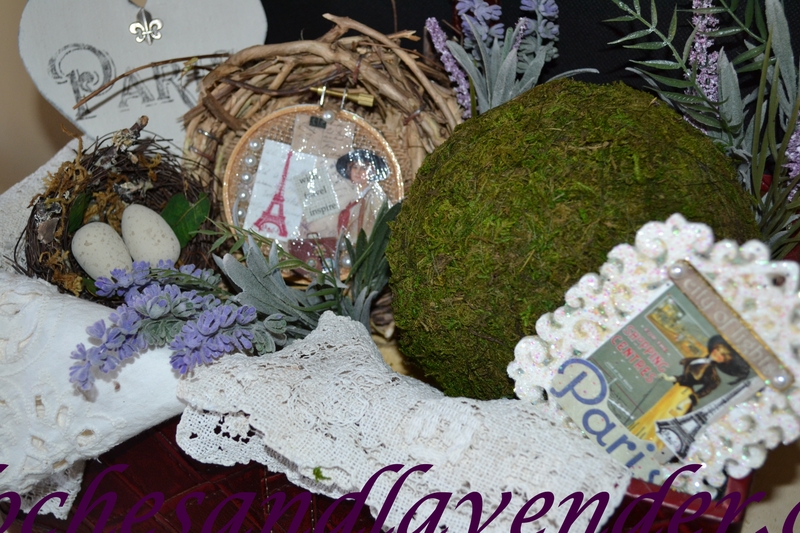 The lace is so pretty, and I thought that tin heart looked like Rosemary’s creation! Love her work! I also really love your buffet that it sits on, so pretty! Wish we would get the memo that spring has arrived, too!! Hi Cindy, your vignette is beautiful. I love the details and treasures you added to the box. 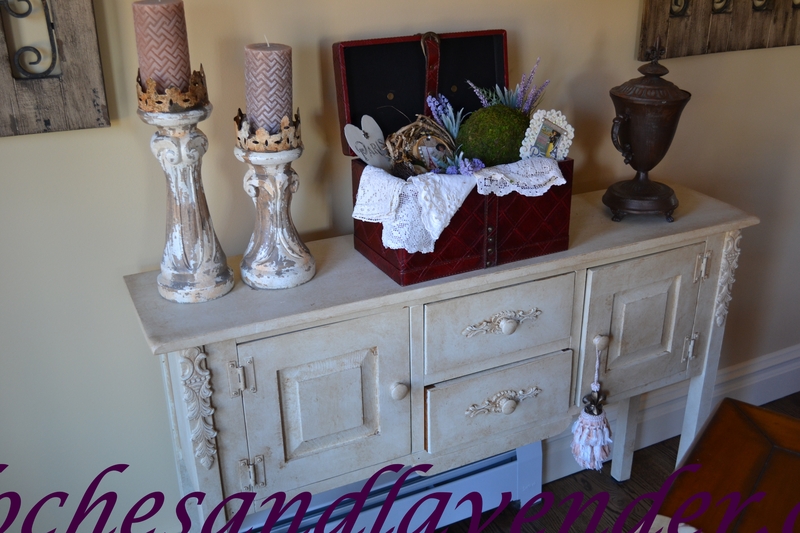 Beautiful accent on your buffet. Thanks so much dear friend. Hope you have great day! OK, all caught up with reading, spring mantels, baskets, bins oh my. And I’ll also add the memo has not arrived here yet either. What’s the deal with the weather. We never see the sun here. It’s as if someone stole it. I love the box Cindy and you have styled it perfectly for Spring! Lavender and green are so pretty together and I’ve always had a thing for moss. lol! Thanks for sharing with SYC. So beautiful Cindy!….and love how you used your Grandmother’s lace! Pretty display! Thanks for joining HSH!